KTUU: Most Alaskan schools below proficiency in PEAKS - Alaska students take an annual Performance Evaluation of Alaska's Schools (PEAKS) assessment test. 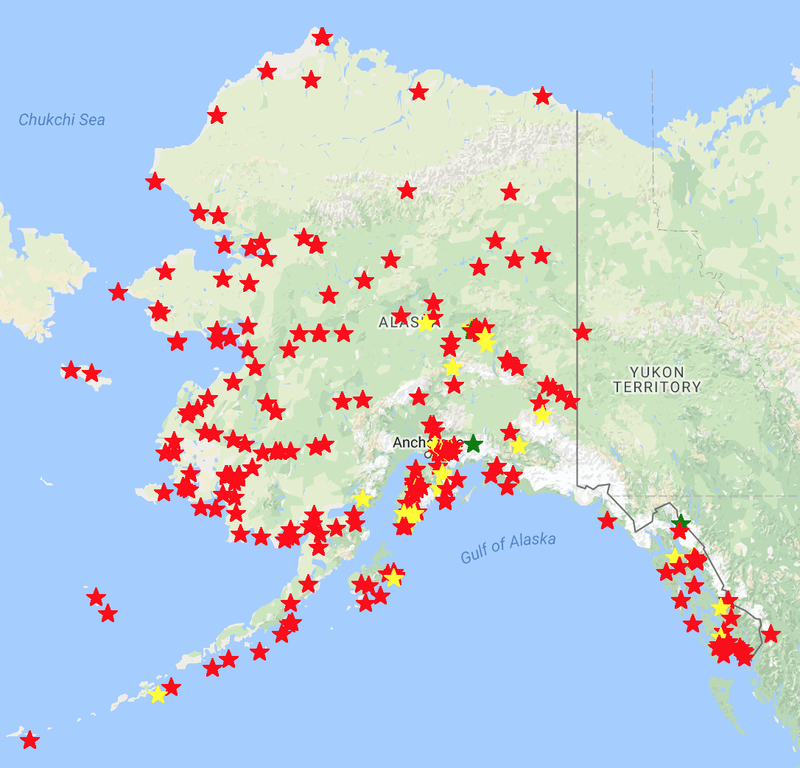 The Alaska Policy Forum released two online maps to depict 2017's public school test results. There's a map for Anchorage and one for the rest of the state. 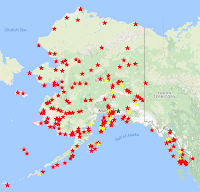 There are lot of red stars on both maps just a handful of green ones around Anchorage. MIT: Mapping gender diversity at MIT - Over the past 20 years, MIT’s female undergraduate population has risen to nearly 50 percent of total enrollment and such growth has been sustained across almost every department and school. Professor of aeronautics and astronautics Karen Willcox, researcher Luwen Huang, and graduate student Elizabeth Qian devised an interactive map to show undergraduate gender diversity at MIT. The 74: Exclusive: New School Safety Map Finds NYC Charters Safer Than District Schools in Wake of Fatal Stabbing - Max "Eden used survey results to create a unique series of interactive maps earlier this year showing how New York City teachers and students felt about the level of discipline and order in their schools along with fighting, bullying, gang activity, and drug use." It seems the maps are of perceived safety. GISCI: GISCI Fall Exam Application Period Continues - "The next testing window for the GISCI Geospatial Core Technical Knowledge Exam® as a part of the GISP Certification is scheduled for December 2-9, 2017, and applications for North American testing locations will continue to be taken into November. The exam will be four hours in length and will require a grade of 75% or higher in order to pass." Forbes: How Is Digital Mapping Changing The Way We Visualize Racism and Segregation? - "A number of digital projects are now using GIS (geographic information systems) in order to highlight these issues using the familiar interface of the map." TES: Stop pitching history and geography against each other – the two can, and should, be studied together - Dr Kevin Standard, the director of innovation and learning at the Girls' Day School Trust, argues it should not be "either/or" but "both." State of the Map (The OpenStreetMap Conference): Videos are appearing already. My Esri colleague Mark Stewart put together a list of resources for teaching and learning about story maps that includes videos, blogs, MOOCs and more. There's an active conversation on Esri's HigherEd-L about teaching with and licensing ArcGIS Pro. WIU: WIU Junior Wins Statewide GIS Award - Western Illinois University junior law enforcement and justice administration major Adam Fackler, of Lake Zurich, IL, was recently named the winner of the Illinois Geographic Information System Association's (ILGISA) Student Award. VTGDigger: 65 coders and 18 teams participate in Vermont’s seventh annual HackVT - HackVT, a hackathon using using geospatial data provided by the Vermont Center for Geographic Information, chose a UVM team as winner of the student prize. The team's app found fishing locations based on users preferences. SUNY Cortland: SUNY Cortland Alumna Maps Bright Future - Mary Colomaio ’15 started college in 2013 planning to be a Phys Ed major, but an accident prompted a switch to GIS. Now she's working on her master's at USC. Appalachian State: Geography major finds adventure and stories in the field - Evan Montpellier is working on a BS/MA at Appalachian State University. PeaceFMOnline: UCC Develops Electronic Conflict Map Of Ghana To Facilitate Peace Building - The University of Cape Coast (UCC) with support from the United Nations Development Programme and the National Peace Council (UNDP) has developed an online electronic conflict mapping book of Ghana. WY Daily: Hewlett Foundation gives $1.5 million to support W&M research team - AidData, a 35-person research lab located within William & Mary’s Institute for the Theory and Practice of International Relations (ITPIR) received a $1.5 million grant from the William and Flora Hewlett Foundation. The three year's worth of funding will support efforts to "help global development policymakers and practitioners make better decisions with data and evidence." Several of the project involve geospatial data and analysis. WMU: University's geospatial sciences designation to be touted at open house - The W.E. Upjohn Center for the Study of Geographical Change and the Health Data Research, Analysis and Mapping Center, known as the HDReAM Center, have teamed to host an open house today. The event will celebrate WMU's designation as one of 25 American institutions named a Center for Academic Excellence in the Geospatial Sciences by USGS and NGA. Greater Kashmir: Training on remote sensing, GIS begins at SKUAST-K - A two-week training program on “Applications of Remote Sensing and GIS in Natural Resource Management today commenced at the Faculty of Forestry, SKUAST-K, Benhama Ganderbal [Sher-e-Kashmir University of Agricultural Sciences and Technology of Kashmi]." Science Trends: Geoscience Department Feature: University Of Texas At El Paso (UTEP) - UTEP’s Geographic Information Systems program got a shout out in a profile of the GeoSciences Department. MyEasternShoreMD: College awarded grant to continue mapping highway safety - "The Maryland Highway Safety Office has awarded Washington College’s Geographic Information Systems Program a grant of $494,000 to continue its work helping minimize fatal and serious injury crashes on Maryland’s roadways." It's the sixth year the program has worked on the study. Penn State: Environmental workforce training program accepting applicants - "Earth Conservancy (EC), in partnership with Penn State Wilkes-Barre Continuing Education, will be enrolling participants in the Environmental Workforce Training Program (EWT), slated to begin in February 2018." Among the courses taught: GIS for Resource Conservation. Bard: Bard College Creates New Digital Media Studio Supported by Gift From Cornelia and Michael Bessie Foundation - "Bard College has created a new digital media studio made possible by a $40,000 gift from the Cornelia and Michael Bessie Foundation. The gift allowed Bard to renovate and equip a classroom in the Henderson Computer Resources Center, converting it into a new media studio." Among the tools: GIS.